The IMF chief aims to salvage globalization by promoting more inclusive growth and greater policy coordination. But can she make herself heard in a world of rising populist pressures? Christine Lagarde is in a reflective mood as she and her staff at the International Monetary Fund prepare to escape the oppressive heat of a Washington summer for vacation. She has plenty of grounds for serenity. She has just started a second five-year term as managing director of the global financial guardian after winning the unanimous support of the Fund’s 189 member countries. The European debt crisis that dominated the IMF’s attention for the past six years has largely abated, even if risks remain and the Fund’s internal auditor has criticized the organization’s early bailout efforts. And Lagarde’s tireless lobbying and diplomacy have put the IMF in its strongest position in years, with dramatically expanded financial firepower, the approval of long-overdue quota reforms to give emerging economies a greater voice in the organization, and strong relationships with arguably her two most important shareholders, the U.S. and China. Yet the atmosphere at the IMF’s Washington headquarters, like that in financial markets, is distinctly uneasy. 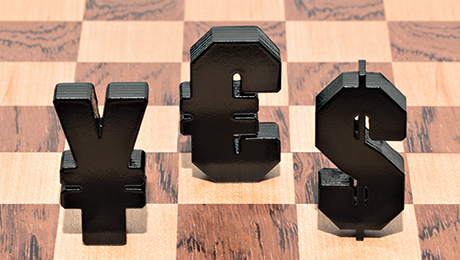 The global economy continues to undershoot expectations. Tepid U.S. growth has stayed Janet Yellen’s hand at the Federal Reserve since last December’s rate hike; doubts about China’s expansion and debt buildup have weighed on the value of the renminbi; the U.K.’s Brexit referendum is fanning concerns about stability in Europe; and several key emerging markets, including Brazil, Nigeria and South Africa, are struggling with varying degrees of economic and political dysfunction. The Fund is expected to reduce its growth forecast once again when it releases its World Economic Outlook in early October, at the start of the annual IMF–World Bank meetings in Washington. More worrying: Sputtering economies are undermining support for an open international economy marked by freer trade and interconnected markets for goods and capital — the very system that the Fund was founded to promote, in the dying days of World War II. The U.K. vote to leave the European Union and the rise of Donald Trump, who captured the Republican presidential nomination by promising to build a wall between the U.S. and Mexico and threatening to impose tariffs on China, reflect a rising populism fueled by insecurity and stagnating middle-class incomes in many advanced economies, particularly the U.S. Left unchecked, this sentiment could foster a wave of protectionist measures around the world, turning today’s sluggish economy into tomorrow’s global recession. Those are unusual words coming from the head of the IMF, which traditionally has played the role of global fiscal scourge, imposing austerity on profligate governments in return for big bailouts. The question is whether those words mean anything, and if so, whether Lagarde and her team of crack economists and policy advisers will be heard. For a global economy that remains mired in an unusually prolonged period of slow growth — secular stagnation, in the words of former U.S. Treasury secretary Lawrence Summers, or the new mediocre, as Lagarde calls it — the Fund’s policy recommendations are awfully conventional. Central banks should maintain accommodative monetary policies; Treasuries with budgetary room for maneuver need to boost spending on infrastructure and other growth-fostering investments; and governments should implement oft-promised structural measures, such as pro-growth labor market policies, product and service market deregulation and financial reforms, to spur growth, senior IMF officials say. “The political pendulum threatens to swing against economic openness, and without forceful policy actions, the world could suffer from disappointing growth for a long time,” Lagarde wrote in a blog post on the eve of the Group of 20 meeting in Hangzhou, China, earlier this month. These days, the idea that fiscal policy should play a bigger role alongside monetary policy in promoting growth is hardly revolutionary. In fact, central bankers are among the biggest proponents of such a shift. The need for public spending to take some of the pressure off central banks was one of the big themes of the Federal Reserve Bank of Kansas City’s economic symposium at Jackson Hole, Wyoming, late last month. Yet few countries are heeding the message. Washington gridlock has kept fiscal policy out of the equation in the U.S. for several years. The European government with the greatest ability to ramp up spending — Germany — refuses to do so, and the Fund has declined to press Berlin on the issue. China has stepped up government spending this year to achieve its growth targets, but the spending risks exacerbating imbalances and aggravating tensions with China’s trade partners, who want Beijing to shift from an export-led model to an economy driven by consumer demand. Policymakers need to do much more than tinker around the margins if they want to put the global economy back on a robust growth path, says Mohamed El Erian, chief economic adviser at German insurer Allianz and a former IMF official, who ran for the managing director’s post back in 2004. His prescription includes big increases in infrastructure spending, corporate tax reform, tackling income inequality in the U.S., moving to some kind of fiscal union in the euro area, and considering innovative measures — potentially including forgiveness — to reduce high debt levels. “If we don’t do something new, something really bad is going to happen,” El Erian warns. Yet even if Lagarde and her colleagues wanted to be that bold, it’s doubtful they would find a receptive audience. The Fund has maximum influence when its money is badly needed — as in the Asian financial crisis of the late ’90s or the more recent European debt crisis — or when member governments face a common threat and have a shared interest in coordinating their policy response, as in the 2008–’09 financial crisis or the currency instability that led to the Louvre accord in the mid-1980s. Neither is the case today, notes Edwin Truman, a senior fellow at the Washington-based Peterson Institute for International Economics. The Fund’s lending is on the wane, and international solidarity is ebbing. “You have to have a sufficiently shared diagnosis that you can share the prescription,” Truman says. Lagarde recognizes that the prospects for policy coordination are modest in the near term, but she is moving in other ways to extend the Fund’s influence and shape the global policy debate for the long haul. She is pushing her officials to use the IMF’s lending and economic surveillance activities to tackle income inequality, enhance economic opportunities for women and combat climate change and other environmental risks. In July, for instance, the Fund’s annual review of the U.S. economy warned about “pernicious secular trends in income: labor’s share of income is around 5 percent lower today than it was 15 years ago, the middle class has shrunk to its smallest size in the last 30 years, the income and wealth distribution are increasingly polarized, and poverty has risen.” To counter those trends, the IMF’s economists recommended a wide range of policies, including increasing the earned income tax credit for low-income households, raising the minimum wage, improving paid family leave and child care assistance, and stepping up training programs and vocational partnerships. Similarly, the Fund has been a big champion of Prime Minister Shinzo Abe’s efforts to increase female participation in the workforce in Japan and advises other countries, including Saudi Arabia, to move in the same direction. For an organization that was established to oversee the global exchange rate system and help countries facing balance-of-payments difficulties, these new issues strike some observers as a case of mission creep. “They are all commendable, but they are not the main job of the Fund, and they never will be,” says one former IMF official, who spoke on condition of anonymity. Yet Lagarde enjoys strong backing from her staff and member governments to focus on this wider range of issues. The extended remit is just the latest evolution of the institution’s mission, akin to its involvement with low-income countries beginning in the 1990s and its role in helping to foster global financial stability, which the G-20 assigned to the IMF in the wake of the 2008–’09 financial crisis. The Fund should address “things that undermine sustained macro stability,” says Siddharth Tiwari, director of the IMF’s strategy, policy and review department. “Inequality does. Migration does. Climate will, sooner or later. On all these things, we would be asleep at the wheel if we did not point out the macroeconomic consequences. Not to bring it into the discussion would be irresponsible.” Inequality, regional conflicts and even drought all helped fuel the social uprisings of the Arab Spring, says Masood Ahmed, who will step down next month as director of the Middle East and Central Asia department: “The next war’s going to be fought over water. That will have huge economic consequences, and we’ve got to focus on them.” Lagarde gets plenty of latitude to expand her terrain because, in the view of most member countries and IMF observers, she has played a difficult hand well over the past five years. The institution was in turmoil when she arrived in July 2011. Her predecessor, Dominique Strauss-Kahn, had been forced to resign over allegations that he sexually assaulted a hotel maid in New York City. Lagarde, then serving as French Finance minister, immediately put her name forward, and despite concerns about yet another European (let alone French national) taking over, she easily beat her only rival, Mexican central bank governor Agustín Carstens, for the job. Greece was already struggling to meet reform targets under its initial €110 billion (then worth $145 billion) bailout, granted a year earlier, and the Fund had recently teamed up with European Union institutions to extend massive rescue programs to Ireland and Portugal. With nearly €80 billion of its own funds at stake and a complicated troika of the IMF, the European Central Bank (ECB) and the European Commission to manage, the Fund needed someone with the experience, clout and political skills to work with EU leaders and save the euro. “She’s guided the Fund effectively through some perilous times,” says Eswar Prasad, an economist at Cornell University and a former Fund staffer. In addition to managing the euro area bailout programs, Lagarde scored two breakthroughs late last year. She finally won the U.S. Congress’ approval of reforms of quotas and voting rights, something emerging-markets countries had demanded for years and IMF members had agreed to in principle back in 2010. “That has rebuilt some of the legitimacy that the Fund had lost,” Prasad says. The institution also agreed to include the renminbi in its currency basket, the Special Drawing Right (SDR), satisfying a key goal of Chinese President Xi Jinping. The renminbi’s addition, potentially the biggest change to the international financial system since the abolition of fixed exchange rates in the early 1970s, will take effect at the start of next month. 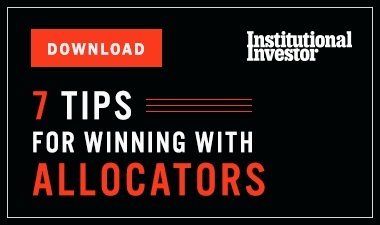 The fund has come a long way from its days as an enforcer of the so-called Washington Consensus, when it imposed tough austerity programs on troubled Asian economies in the wake of the region’s 1997–’98 financial crisis and touted the merits of free trade, privatization and liberal regimes on cross-border capital flows. In recent years the organization has tempered many of its fiscal recommendations and revised its thinking about when and how to lift capital controls. Officials are more willing to admit they don’t have all the answers — a healthy dose of humility given the Fund’s repeated failures, alongside those of most other official bodies, to predict the course of the postcrisis recovery. What haunts Obstfeld, like many other economists and policymakers, is the risk of a negative feedback loop in which today’s low-growth and low-productivity trends depress tomorrow’s consumer spending and investment, which in turn suppress growth on an almost permanent basis into the future. In our increasingly interconnected world, where concerns about Chinese or European growth can boost the dollar, raising fears about the U.S. recovery and prompting the Fed to hold off on rate hikes, no country appears able to break out of the cycle on its own. That requires the Fund to play the role of cheerleader for global policy coordination, as Obstfeld puts it. “There is a global problem of low aggregate demand and low growth,” he says. “National measures could be much more effective if they were implemented simultaneously.” Appeals for policy coordination are more often honored in the breach than in the observance, though. At their Hangzhou summit earlier this month, G-20 leaders once again pledged to step up policy coordination but made few concrete commitments. That may be just as well. Two years ago the G-20 endorsed an action program of country-specific policy recommendations designed to boost the group’s collective output by 2 percent over five years, but members have failed to deliver on many of those promises. Critics say the Fund is playing small ball and failing to offer the kind of bold, imaginative policy proposals required to lift the global economy out of its doldrums. Back in 2010, Obstfeld’s predecessor, Olivier Blanchard, issued a paper suggesting that countries raise their inflation targets to 4 percent — double the prevailing standard — to avoid the risk that interest rates could get stuck at the so-called zero bound, the supposed limit for policy rates. Blanchard took a beating for suggesting something that was considered heretical in central banking circles, and the Fund quickly dropped the idea. Six years later, however, the ECB, the Swiss National Bank and the Bank of Japan have cut rates deep into negative territory in desperate bids to spur their economies and fend off the risk of deflation, while the president of the San Francisco Fed, John Williams, has dusted off Blanchard’s proposal and suggested raising the inflation target to give the Fed more leeway to ease monetary policy in case of a slump. Preventing the spread of bad ideas, such as the rolling back of globalization, is as much of a priority these days as the drafting of exciting new ideas. The backlash that Lagarde perceives is evident in World Trade Organization data showing that international commerce in goods and services has declined as a share of the global economy since 2012 — the first time that’s happened for a prolonged period since World War II. For David Lipton, the IMF’s first deputy managing director and Lagarde’s right-hand man, the challenge of today’s populism represents a stark change from the mid-’90s, when he served as a senior official in the U.S. Treasury under Robert Rubin and Larry Summers, the high priests of the Washington Consensus. With rival Donald Trump disparaging the North American Free Trade Agreement as a “disaster” and promising to bring jobs back to America with more-protectionist policies, Democrat Hillary Clinton has distanced herself from her husband’s trade legacy and come out against Barack Obama’s signature initiative, the Trans-Pacific Partnership. Globalization gets unfairly blamed for a lot of the economic insecurity generated by the high-debt, low-growth aftermath of the global financial crisis and the rapid pace of technological change, Lipton says, and the IMF needs to robustly defend the openness of the global economy. But he acknowledges that the entry of China, with its massive supply of cheap labor, into the global trading system has been very disruptive and that it demands a policy response from the U.S., Europe and other advanced economies. 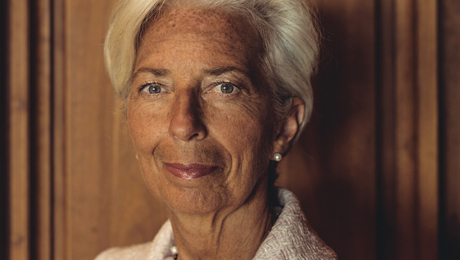 The IMF's evolution under Lagarde can be seen clearly through its involvement with Europe, which defines the Fund’s recent past, and with China, which may be its future. The institution was already deeply engaged in Europe, its biggest and most complicated bailout effort ever, when Lagarde arrived. The debt crisis erupted in late 2009, when the newly elected Socialist government of then–prime minister George Papandreou announced that Greece’s public finances were in far worse shape than expected and revised the projected deficit to 12.7 percent of gross domestic product, more than double his predecessor’s estimate. Under Strauss-Kahn’s leadership the Fund made the critical decision in May 2010 to extend Athens more credit relative to its IMF stake — 3,200 percent of the country’s quota — than it had ever done, even though its own economists judged Greece’s debt to be unsustainably large. There were strong reasons for doing so. Financial markets were still wobbly, Europe was recovering more slowly than the U.S. from the global crisis, and officials feared a Greek default could spur a Lehman Brothers–like collapse, forcing Greece out of the euro and potentially triggering a breakup of the single currency. The report amounted to “a pretty searing indictment” of the organization’s role in the bailouts, says former IMF staffer Prasad. “The IEO report stings because it laid bare the importance of political factors in the IMF’s decision-making process,” he adds. Greece, meanwhile, continues to wither. Its economy is 45 percent smaller today than it was before the crisis erupted (by comparison, U.S. output shrank by a quarter during the Great Depression), unemployment is just below 25 percent, and debt has ballooned to 180 percent of GDP. After the economy’s slight recovery in 2014, the debt-talks brinksmanship of Prime Minister Alexis Tsipras tipped the country back into recession in 2015 and 2016. Growth once again is forecast — for next year. Under Lagarde the Fund has gradually broken away from the German line of demanding tough austerity measures in Greece and advocated more-realistic fiscal and economic targets combined with debt relief. The IMF stopped disbursing funds to Greece in 2014 and declined to join the EU when it released a fresh €10.3 billion in May, because the Europeans provided no debt relief and called on Athens to achieve a primary budget surplus (that is, before interest) of 3 to 3.5 percent of GDP, more than double what the Fund considers possible and a far cry from today’s deficit of 0.5 percent. Few countries have ever sustained a surplus of that size, much less a nation like Greece, which has seen seven governments and ten Finance ministers since the crisis broke out. The Fund doesn’t rule out reengaging in a future support package, but “it has to add up,” says Poul Thomsen, who heads the European department and has overseen the Greek negotiations from the start. IMF officials worry about potential backsliding by the Portuguese government on its economic adjustment program; the electoral impasse in Spain, which hasn’t produced a successor government in the past nine months, also makes them uneasy. More broadly, Europe still struggles with high debt, high unemployment and low growth. In July the IMF’s latest review of the euro area economy bluntly criticized the bloc for failing to carry out many structural reforms leaders have long endorsed, including the completion of a banking union and a capital markets union to strengthen the financial system, product and labor market reforms to spur growth and more EU-funded infrastructure spending, as proposed by Commission president Jean-Claude Juncker. “The implementation record is pretty poor across the board,” says Mahmood Pradhan, deputy director of the European department. 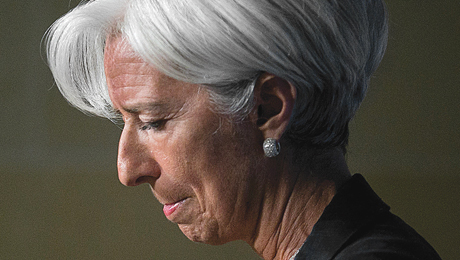 Some critics chide the IMF for not challenging Germany. Lagarde advises countries that have fiscal space to use it to support growth, but the Fund’s euro area review did not call out Berlin despite the fact that Germany is set to have a slight budget surplus this year and run a current-account surplus of 8.5 percent of GDP. “The Fund is still a little bit reluctant to abandon its traditional focus on limiting fiscal deficits,” says Brad Setser, a senior fellow at the Washington-based Council on Foreign Relations. Rising populist pressures won’t make reform any easier and might aggravate Europe’s economic woes. Chancellor Angela Merkel suffered an embarrassing defeat at the hands of the right-wing Alternative for Germany party in her native state of Mecklenburg–Western Pomerania early this month, and Marine Le Pen, the anti-EU National Front leader, currently tops the polls for France’s presidential election next May. With China, Lagarde has sought to enhance the Fund’s surveillance of the mainland economy, the world’s second largest, while strengthening relations with the Beijing leadership. One of the first things she did after taking over as managing director was to elevate Min Zhu, a former top People’s Bank of China (PBOC) official whom Strauss-Kahn had recruited as a special adviser, to a newly created deputy managing director position — in effect, creating a Chinese seat at the very top of the IMF’s management. The symbolism wasn’t lost on Beijing, which has pushed for a level of influence and visibility at the Fund commensurate with its newfound economic status. The move also strengthened ties between the Fund and China’s central bank, which Lagarde and her team consider the country’s strongest force for market-oriented economic reform. Reflecting the new global economic pecking order, Lagarde’s team now includes Lipton as first deputy managing director, a post traditionally held by an American; a Japanese deputy managing director, Mitsuhiro Furusawa, a former special adviser to Prime Minister Abe; a Chinese deputy managing director, Tao Zhang, a former PBOC deputy governor, who succeeded Min last month. A third deputy managing director seat has no national flag attached to it; the post is currently held by Carla Grasso, a Brazilian and Italian national and former senior executive at Brazilian mining company Vale who serves as the Fund’s chief administrative officer. Relations with China further improved after the Fund agreed last November to include the renminbi in the SDR, saying it had fulfilled the criteria for being considered a freely usable reserve currency. The change will take effect on October 1, when the renminbi joins the U.S. dollar, euro, Japanese yen and British pound in the currency basket. It will rank third in importance, making up 10.92 percent of the SDR, behind the dollar (41.73 percent) and the euro (30.93 percent) and ahead of the yen (8.33 percent) and the pound (8.09 percent). The irony is that international use of the renminbi has stalled since the Fund’s decision. The currency accounted for 1.72 percent of global trade payments in June, down from 2.79 percent ten months earlier. More significant, the renminbi has weakened more against the dollar since the end of 2015 — falling 2.5 percent, to 6.6628 to the greenback — than it did in the sudden, one-day depreciation in August 2015 that triggered turmoil in global financial markets. The renminbi has fallen by 7 percent against the CFETS RMB Index, a currency basket the PBOC launched late last year. George Magnus, an Oxford, England–based economist and adviser to UBS, suspects Chinese authorities are tacitly encouraging an orderly currency decline to give their economy a boost. If the slide continues, he wrote in a recent blog post, “then we will know that something has changed, suggesting that China is in fact going for a more significant depreciation.” If that’s the case, it would inject more deflationary pressures into the global economy and likely forestall any attempt by the Fed to raise interest rates. 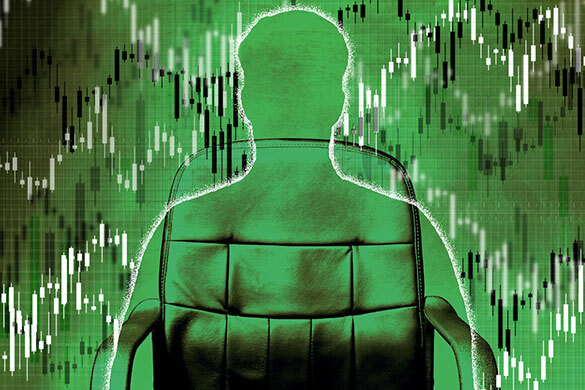 The reaction in financial markets, judging by the August 2015 tumult, could be severe. China managed to grow at a 6.7 percent rate in the second quarter, ahead of Beijing’s target of 6.5 percent for the year, but the nature of that gain — driven by fiscal stimulus and investment by state-owned enterprises, banks and local authorities — worries many analysts. The Fund was blunt last month in its annual review of the Chinese economy, calling on the authorities to take urgent action to rein in SOEs, slow the rate of credit growth and facilitate the transition to a consumer-led economy, even if that means a moderate slowdown in the growth rate. “China has had a couple of quarters of solid growth, and now everyone is incredibly complacent, but the longer-term imbalances in that economy are actually not being addressed as quickly as we would like to see, and that creates a risk,” says chief economist Obstfeld.